JAPAN: German manufacturer Senvion has been awarded a turbine supply order from Japan Wind Development for a 23.8MW project in Akita prefecture, northern Japan. The Wakami project is being developed by Japan Wind Development and Mitsui Engineering & Shipbuilding. The seven 3.4MW turbines will be installed with 104-metre rotors, at a hub height of 80-metres. Senvion said the machines will be adapted to cope with the seismic activity and typhoon wind speeds regularly experienced in Japan. Japan Wind Development has 330MW installed in Japan to date, according to the turbine manufacturer. Senvion itself has installed 124MW, or 71 turbines, across Japan, and has had a presence in the country since 2003, the company added. The potential for wind power in Japan had raised high expectations. However, the wind sector remained in the doldrums last year, with just 177MW of new capacity added in 2017. Japan aims to increase the proportion of renewable energy sources to 24% by 2030. Last month, the Global Wind Energy Council said the market saw "stirrings" last year, with the government looking more closely at developing offshore wind sites. 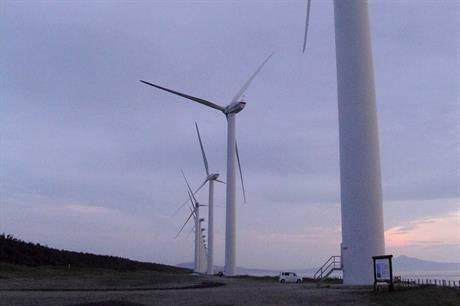 Also last month, US developer Pattern Energy acquired 167MW of wind projects jointly owned by one of its investment funds and a Japanese subsidiary, marking its first direct move into the country's energy market.